While supporting Documentum, there can be a complex situation where we have to rename the user and reassign all objects where user was the owner or a participant to the new name. Following are the list of objects which needs to be changed. All these things except last 3 can be changed at one shot using “Reassign” tool of Documentum Administrator. The last 3 items needs to be reassigned manually. 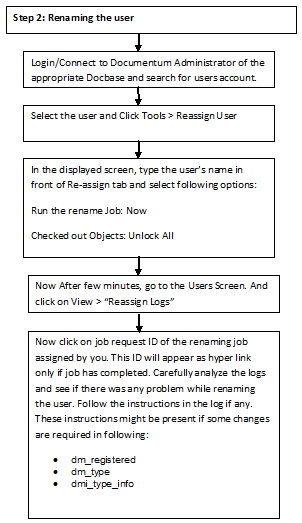 The process for using reassign tool is as in below. 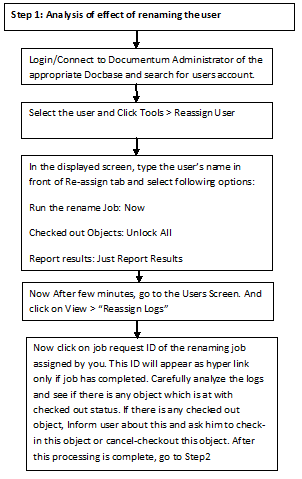 The process which can be used to rename the user is described in below flowchart. It is a two step process. In step1, we will analyze the effects of renaming the user. In step2, we will go ahead and rename the user. Documentum Administrator is the Web-based tool for administering Content Server. By Documentum Administrator all the administrative tasks for a single installation or a distributed enterprise can be performed from one location. One of the administrative tasks of Documentum Administrator is User Management. To access a Docbase, a person must be defined as a user in that Docbase. The Administration/User Management displays a list of users in the current Docbase. Search for users can be done by their user name in the Docbase, user OS name (name on the operating system), or default group. 1. Connect to the Docbase where we want to locate a particular user. 2. In the left-hand pane, click Administration. One must have Sysadmin or Superuser privileges to create users. 1. Connect to the Docbase where we want to create new users. 2. Click Administration –> User Management. Docbase whereas an inactive user cannot. 5. In the Name field, type the user’s name. 6. Select a User Source from the drop-down list. UNIX Only: Select this for the default UNIX user authentication. Domain Only: Select this if the Docbase has Windows domain authentication enabled and the user must be authenticated against a domain. UNIX first: Select this if the Docbase has Windows domain authentication enabled and the user must be authenticated first against UNIX, then against a domain. Domain First: Select this if the Docbase has Windows domain authentication enabled and the user must be authenticated first against a domain, then against UNIX. LDAP: Select this if users are authenticated against an LDAP server. notifications are sent for workflow tasks and registered events. user to login to the docbase. 9. In the Windows Domain field, type the user’s Windows domain. 10. Select a home Docbase for the user. 11. Designate the user’s default folder which is the default storage place for any object the user creates. To use an existing Docbase folder, click Choose existing folder and to create a folder with the user’s name, click Choose/Create folder with user name. 12. Click Select Group and select a default group for the user. 13. Click Select Permission Set and select a default permission set for the user. 14. Select the user’s privileges from the drop-down list. 15. Select the user’s client capability from the drop-down list. 16. Click Finish and new user is created. We can remove users from the Docbase, but Documentum strongly recommends making users inactive rather than deleting them from the Docbase. When a user is deleted, the server does not remove the user’s name from objects in the Docbase such as groups and ACLs. Thus when we delete a user, we must also remove or change all references to that user in objects in the Docbase.